Just call him the Mighty Quinn! Roman Quinn had two hits, two RBI, a stolen base and made a big impression in his second major league game, leading the Phillies to a 6-2 victory over the Pittsburgh Pirates last night. A day after he was promoted to the big leagues, Quinn hit second and played right field in his second straight start. 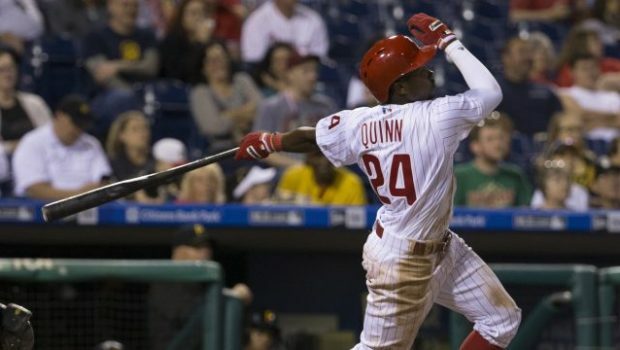 Quinn, an accomplished base stealer and the Phillies’ second-round draft pick in 2011, could be a fixture in the outfield next season. With the Phillies long out of contention, manager Pete Mackanin is likely to take a long look in September at a player who could become a starter in 2017 when they hope to inch toward contention. Quinn doubled in the second and sixth innings to help the Phillies snap a seven-game home losing streak. Quinn’s two-run double in the second one-hopped the wall as part of a five-run inning that made it a short night for Pirates starter Gerrit Cole (7-10). The 26-year-old Cole allowed five runs in two innings in his first start off the disabled list. He was sidelined with elbow inflammation and hoped his return could boost a Pirates team that is all but out of the NL wild-card race. “I know he’s not pleased with the result, and with the preparation he put into tonight, it’s understandable,” manager Clint Hurdle said. Cole threw 29 of his 55 pitches for strikes — and two of his Ks were against Ryan Howard. Once one of the most feared hitters in baseball, Howard is limping toward the finish line of his final season with the Phillies. He entered hitting .195 and each hitless game puts even a measly .200 average out of reach. Howard’s failure this season put pressure on others around him to produce, notably Maikel Franco. Franco was fantastic in 80 games last season and showed just enough (14 homers, .280) at the plate to show he could be the third baseman of the future. He still might be, but a .247 average and 22 homers in 133 games showed he felt the pressure of trying to handle Howard’s role as the slugger in the middle of the lineup. Phillies centerfielder Odubel Herrera also has slumped in the second half — the All-Star saw an average that reached .319 through 51 games dip to .275 on Monday. It’s one more reason the Phillies want to play Quinn in September. He had his first career stolen base (he stole 31 for Double-A Reading) in the first inning to ignite his night. Mackanin said Herrera would stay in center for the rest of the season. He would make a decision on where the outfielders play in spring training. Jeremy Hellickson (11-9) struck out six and allowed an unearned run over 6 1/3 innings for the win. Freddy Galvis hit his 18th homer of the season. Previous WHY NO ONE TAKES A KNEE IN BASEBALL: IT’S A WHITE MAN’S SPORT! Next PHILLIES YOUNG GUNS ALFARO, QUINN GETTING A LONG LOOK FOR 2017!